This week’s “Back-Up of the Game” presented by Venyu is safety Delano Howell. After being inactive for the first two games of the season, Howell has started in place for LaRon Landry the last three weeks. His impact on Sunday came via a Lawrence Guy blocked field goal in which Howell caught the ball out of the air and returned it 61 yards for a touchdown to give the Colts their first lead at 14-12. The blocked field goal returned for a touchdown was the fourth in franchise history and the first since Dec. 5, 2004 when Rob Morris returned a block 68 yards for a score. Along with the blocked kick, Howell added three tackles and had blanket coverage on a Russell Wilson pass attempt during Seattle’s final drive of the game. “The great thing I think about our team is that we have great coaches, great leadership and they always put together a great plan,” Howell said after the 34-28 victory. The Colts began the second quarter of their schedule by knocking off the undefeated Seattle Seahawks. Today’s news looks at the Colts as a Super Bowl contender, how this win compares to the one over Green Bay last season and yet another fourth-quarter comeback. Take a look below at the top pieces from Monday, October 7th. The Colts are just five weeks into the 2013 regular season but thanks to a pair of wins over two of the top teams in NFC, the words “Super Bowl” are being thrown around with this team. A lot of national folks saw last year’s Colts and saw a fluke, a team that won games despite its humble talent level, a team that overachieved as it played with its recovering head coach in its heart. Those same folks thought the Colts would regress, that the same esprit d’corps would be vanquished, and they would tumble to 8-8 or worse. They are still writing the same script. Still making magic in the fourth quarter. Still defying the odds. They are not, after all, a one-year wonder. They are a team – if they stay reasonably healthy – that can win the whole thing in just the second year of rebuilding. Holder looks at last season’s comeback over win over the Green Bay Packers that happened nearly one year ago to the exact day as yesterday’s comeback win. It was exactly one year ago when his team found itself in a similar predicament — trailing and playing listlessly — against the GreenBay Packers, a situation that required everything the team could muster in a furious fourth-quarter comeback. Pagano, undergoing treatment for leukemia, watched the stirring victory from his hospital room. Fast forward 12 months and the calendar has changed, Pagano is healthy and the opponent wore different colors. But the Colts were at it again, overcoming a top-flight opponent, their own mistakes and the scoreboard in — of course — the fourth quarter. And by nobody, he meant nobody. Because it took a gargantuan effort from all involved to pull this off. This wasn’t just Andrew Luck authoring another fourth-quarter comeback (although he’s now got nine in 21 pro games). Once again, there was no panic with No. 12 in the Colts offensive huddle. Business as usual and just another fourth quarter comeback for Andrew Luck. Sunday was the ninth fourth-quarter comeback by Luck in only 21 NFL games. Yes, nine of the Colts’ 15 victories over the past two seasons have been been come-from-behind wins led by the second-year quarterback. Jake Plummer is the only other quarterback who can say he has nine fourth-quarter comebacks in his first two seasons. Luck still has 11 more games this season to top Plummer. That, too, is typical Luck. He has not interested in talking about his individual success. It’s all about what’s best for the team. 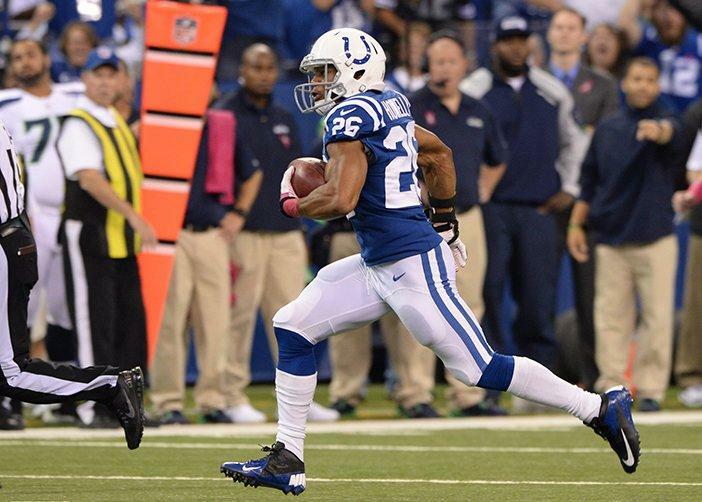 INDIANAPOLIS – In Sunday’s 34-28 win over Seattle, Indianapolis snapped 60 offensive plays. After only nine, the Colts were staring adversity squarely in the face. Those opening plays gained nine yards and no first downs, and Pat McAfee’s third punt was blocked through the end zone. Undefeated Seattle led, 12-0. Antoine Bethea motioned teammates together on the sideline to deliver a message. Indianapolis forced a three-and-out, then scored two quick touchdowns for a 14-12 lead. After Seattle countered by taking a 25-17 advantage in the third quarter, the Colts scored 17 points and snuffed out two late drives to earn a comeback victory over a team that had won nine straight games. The victory was the ninth comeback triumph in 21 outings under Chuck Pagano. It placed the Colts alone atop the AFC South five games into the season. HILTON IS CENTRAL ELEMENT – Four plays after falling behind 12-0, T.Y. Hilton was in the end zone with a 73-yard grab (32 yards coming after the catch). On third-and-22 from the seven six minutes before the half, Hilton was interfered with and the Colts had 39 penalty yards. Hilton then had a 13-yard reception to convert another third down, leading to a half-ending field goal. Hilton’s lone third-quarter reception was a 29-yard TD strike. Early on the fourth-quarter 86-yard scoring drive, Andrew Luck targeted Hilton on third-and-10 from the 25. Interference, 16 yards. On second-and-11 from the 40, Hilton had a 13-yard catch. On third-and-eight from the Seattle 45, Luck found Hilton again for 12 more clutch yards. That was the last time Hilton was targeted, and he had done an afternoon’s work. On six targeted times, he had five receptions for 140 yards and two scores, his seventh 100-plus outing. Two penalties added 55 more yards, coming on drives that accounted for 11 points. Well done, #13. FREEMAN FACTOR – Jerrell Freeman has been a disruptive presence all season. Strip-sacks against Miami and San Francisco made him the first Colts linebacker since 2004 not named Dwight Freeney or Robert Mathis to have quarterback takedowns in consecutive games. The mobile Freeman tracked down Russell Wilson for no gain on third-and-two with seven minutes to go. The Colts were clinging to a 31-28 lead that was in doubt. Up 34-28, Freeman rushed Wilson into an interception with 1:23 left. Game-set-match, or, according to Reggie Wayne, “Ding, ding,” the bout was over and the referee held up the Colts’ hand. Either way, Freeman has had a telling hand in many plays. This is not something truly learned, just something cited as contributing factors in a big-time win. A FEW GOOD MEN – Pagano has his men believing that every one of them can make a difference. Take bows Delano Howell and Lawrence Guy. Howell has started twice in place of LaRon Landry. He has made plays before, but his 61-yard return of a blocked field goal was a huge comeback impetus. The person who triggered it was Guy, who was signed recently to add depth to a thin defensive line. Howell had the eye candy with a great return (the third-longest in club history off a blocked field goal), but Guy provided the grit. Neither player garners a great deal of spotlight, but both’s professionalism created a big play Sunday against a team that excels on specialty units and against a kicker whose first miss of the year resulted in points for the opponent. While we’re at it, bow yourself Tom McMahon. NO JUDGES – After two blowout wins by a 64-10 combined margin, the Colts were on the ropes down 12 and with a Seattle offense that had knifed for two scores and 92 yards on 13 snaps. Seattle would land more haymakers and Indianapolis would have to rally from behind most of the day. It did so on the one-year anniversary of the 30-27 comeback victory over Green Bay. That day a year ago was one of the most compelling in the club’s Indianapolis era, with its head coach in a hospital battling leukemia. Pagano was present Sunday to marshal another special victory. Outsiders tend to tune out themes used by coaches. Pagano’s players don’t. They live the themes and play them out on Sundays. It would have been easy to fold under pressure and deficits yesterday, but the Colts didn’t. Fans now have first place team (with 11 challenges ahead), one that hangs together.